The baseball team takes its 3.5 game SEC league lead down to Gainesville this weekend to take on the Gators. 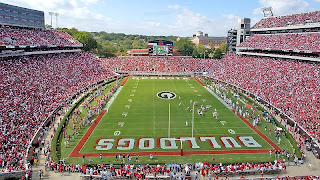 Baseball doesn't get the attention that the Cocktail Party would, but the series is just as important to the Diamond Dawgs as the football game is to Richt and the football team. Florida is 10-8 in conference and in third place. The Gators led the SEC for several weeks earlier in the year, but have stumbled lately. They haven't won a conference series this month and have lost five of their last seven. A series win this weekend would hurt 'em, bad. The Gators still have South Carolina and Vanderbilt to go. If we win two of three, it doesn't look good for the Gators. And, a series win should put us in prime territory for a full frontal assault on the SEC crown. The Dawgs will use their normal weekend rotation of Holder, Dodson, and Moreau. The Gators are saving their best pitcher (at least statistically) for Sunday. Second baseman Josh Adams leads the Gators at the plate. Adams is a freshman, but he's having the type of season seniors envy. He's batting .354 with 40 RBIs. The rest of their lineup looks solid, but not spectacular. Brandon McArthur (returning from a torn ACL this weekend) and Matt den Dekker are good hitters, but the Gators don't have much else that pops out on paper. Sun Sports is broadcasting the first two games of the series this weekend, if you get that channel. As you said, this is a great chance to bury the Gators and solidify our SEC lead at the same time. If we can take this series on the road, we would be left with two home series (inculding one against a bad Alabama team) and one tough trip to Nashville. South Carolina is playing good ball right now so it would be good to keep pace ahead of them. One other player to watch for UF is Cole Figueroa. He can be fairly clutch when the situation demands it as a contact hitter. If we can win tonight, we're going to set the tone for this series. The Gators need to sweep us to have any serious chance of getting back in the SEC race and they know it. If we can send a message tonight, I really wouldn't be surprised to see a sweep. If they're winless by Sunday they might just fold up the tent.